AVOID KEEPING STORM PHOBIC DOGS OUTSIDE where they have no escape from the elements! 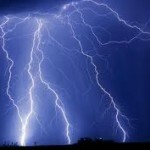 Establish a Safe Place- usually deep in the house, where noises and lights from a storm are most muffled. Think: closet, inner room without windows. Set up a bed or the dog’s crate in this area. This can be where you feed him, where you keep his toys and where he sleeps. This area should be accessible during storms, even when you are not home. Avoid giving a lot of attention to your dog when you are home during storms. He will learn to become dependent on you to comfort him and may have even worse anxiety if a storm hits while you are not home to help him. with her favorite treat can help take the fear out of a storm! 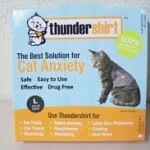 Try a Thundershirt® or Anxiety Wrap®. These wrap around your pet, swaddling him. This technique works great on some pets! Calming Caps® are another product that quiets some dogs who will tolerate something over their face and eyes. It’s not a good choice for pets who resist having their heads/ faces controlled. Desensitize your pet to thunderstorm noises by playing thunderstorm “music” at a very low level while working on obedience behaviors and giving rewards when she is not showing any anxiety. 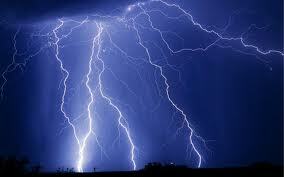 Gradually increase the volume of your thunderstorm noises, rewarding as long as there is no anxiety. Back the volume off at the point where early signs of anxiety occur. This should be done all year long! Doing this training when there are no storms imminent helps take out at least one of the storm factors that trigger a lot of dogs: unexpected noise. If these tactics don’t work, it’s time to consult a professional. A trainer may have additional suggestions for your particular home environment or dog’s personality. Your veterinarian is a fabulous source of suggestions as well. In addition to environmental and behavioral modifications your veterinarian can also prescribe anxiety medications for your pet.